Sunny Yuen and Tsui Siu-ming play orphaned Shaolin buddies raised in the sacred art of the Buddhist Fist and all its variations. Sunny’s Dad, a police chief, goes missing for two months without anybody noticing, and when Sunny’s investigations into his father’s disappearance has him fending off a tumultuous array of quirky bad guys desperate for his balls, he begins to suspect those closer to home. But surely not; a Buddhist monk as the film’s master criminal? A conniving thief out for all he can get and stealing China’s remaining jade treasures? There is little in the way of surprises in this early Yuen Clan romp, but Woo-ping‘s sensitive side does seep through via the boys’ playful affections and the monk’s complex psychology. What sets this aside from many, many others of its kind is the director’s gradual progression into a more experimental and inventive style of film making. The fight choreography takes many unexpected turns, transforming ordinary situations (a meal or a game of chess) into magnificently crafted routines, with everyday items transformed into lethal weapons. 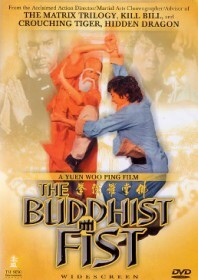 His sense of humour would later get much broader and the kung fu more eccentric (Dreadnaught, Drunken Tai Chi), but The Buddhist Fist sees Yuen Woo-ping in a wonderfully reflective mood and his feet still firmly on the ground. The result is a rough diamond. Studio: Peace Film Production Co.